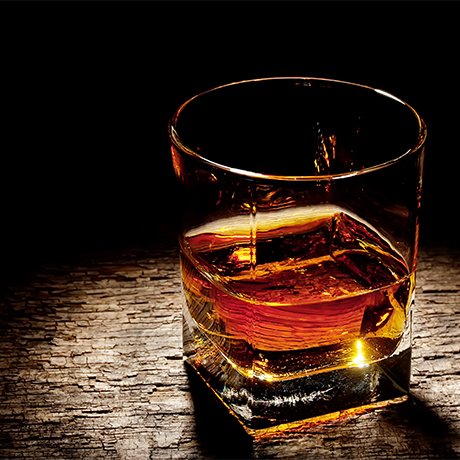 A famous name in the world of Scotch whisky and wine, and one which has survived to the present day. Cockburn & Co was formerly a whisky blender and wine and spirits merchant based in Leith, though is now dedicated to the importation, wholesaling and online retailing of wine and most famous for its brand of Port. The company was founded in Leith during 1796 by brothers John and Robert Cockburn, though Robert ultimately left the business and emigrated to Portugal, where he established the family name as a leader in the port wine trade. Cockburn’s numbered Sir Walter Scott, Thomas Carlyle, Charles Dickens and members of the Royal Family among its clients, and a record of 31 December 1868 reveals that Dickens paid £35 8s in cash for a cask of Cockburn’s whisky. The company’s branded products included Cockburn’s Pure Highland Malt, OV 8 Years Old, Old Decanter 12 Years Old, Imperial Gold Medal and Dominie. Having changed hands on a number of occasions, Cockburn’s was acquired by Seagram’s and in 1981 was purchased by The Drambuie Liqueur Co Ltd. March 1993 saw the business acquired by the Wine Company (Scotland) Ltd, but in 2010 Cockburn’s entered administration. It was rescued by Edinburgh Wine Importers, which is owned by former Rangers Football Club chairman and oenophile Sir David Murray. Single malt made at Knockdhu distillery. Heavily peated single malt Scotch produced at the multifaceted Loch Lomond distillery in Alexandria. Despite its name, this Islay single malt from an unnamed distillery is more at home in Scandinavia.